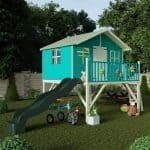 We liked the attractive and classic design of this bigger than average playhouse, and can imagine that it will be even more eye catching once its been painted in colours that your children or grandchildren love. 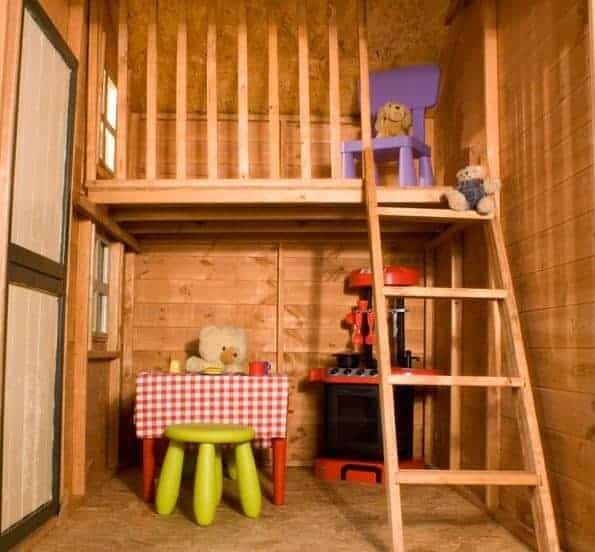 What the little ones will like most about it is that there is lots of room to play inside, and on two different levels as well as this playhouse features a loft area that’s accessible via an internal ladder. The loft area is made safe to play in thanks to a safety rail, and safety is a factor that’s been kept in mind throughout the design and construction process as shown by the use of styrene glazing in the windows. Further reassurance in this area is given by the fact that it complies with the European toy safety standard EN71 that’s also used for playhouses. It’s also important of course that the interior stays snug and dry, and the apex roof helps to achieve this by channelling rainwater safely away. The walls are very effective at keeping precipitation out as well, thanks to the strong tongue and groove cladding used. To create an even more effective defence against wet rot, however, preservative treatments will need to be applied on an annual basis. 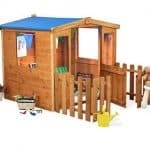 If you’ve had a playhouse before then you’ll know how much children love them; after all it gives them their own corner of the garden that’s all about them and that’s an area designed for fun. One of the things that we liked most about this particular playhouse is that it offers two levels, and therefore creates a lot more space for playing games or simply for letting young imaginations take flight. The loft is accessible by a safe and easy to climb ladder, and also has its own window for children to look out of. On sunny days, children can also play in the shade outside the playhouse, thanks to the canopy effect of the overhanging roof. One reason that this playhouse is so versatile is that it’s larger than most playhouses that we review. With a loft area it has to be much taller as well, which is why the rain repelling apex roof has one of the tallest peaks we’ve seen on a playhouse. The ridge height is 2.04m, and the eaves height is 1.66m. When combined with the overall width of 2.11m and overall depth of 1.47m, not including the overhang, it shows just how much room for fun is available. 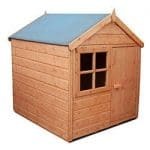 A beautiful and practical playhouse such as this can get a lot of use, so it has to be strong and sturdy. That’s why we were pleased to find that the walls are made of tough and reliable tongue and groove cladding; at 12mm thick it creates a rigid and stable structure once assembly is complete, and yet the boards are still lightweight and manoeuvrable during the installation process. The floor is lightweight too, being made of more cost effective solid sheet material. It’s thickness of 10mm is a little thicker than some that we see, and this should be more than adequate for its purpose. There are lots of areas in which we were impressed by this two level playhouse, but it has to be said that they were disappointed in the warranty provision. In fact, there is no extended warranty period at all so customers only get the statutory one year cover. They will also have to treat the playhouse regularly themselves with a high quality wood preserver, at least once a year is our recommendation, as the basic dip treatment used by Windsor won’t last for long. 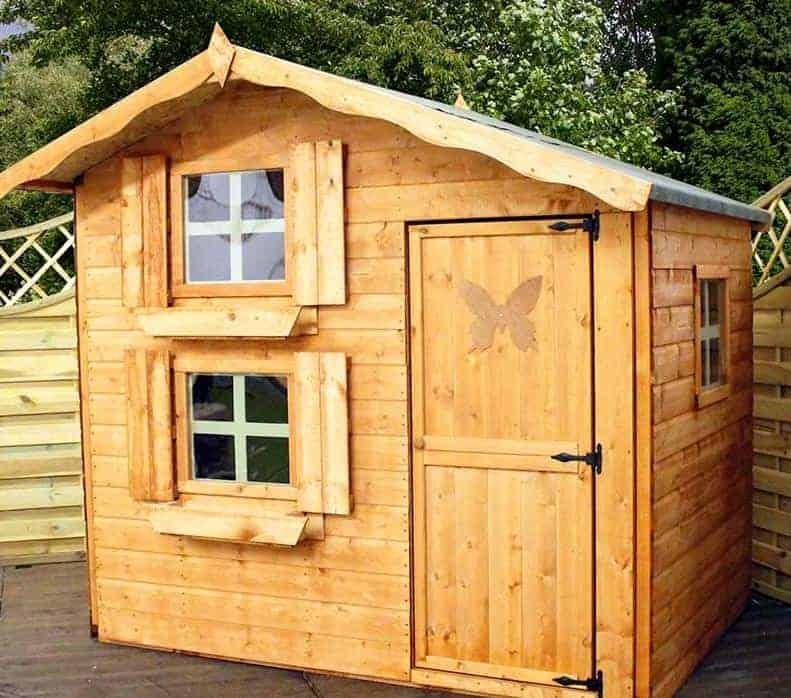 As this is one of the more expensive playhouses we’ve seen in this size range, we would have liked to see a longer lasting treatment used and therefore a longer lasting warranty as well. The door width of 0.58m closely matches many of the single hinged doors that we see on playhouses, but the door is substantially taller than most with a height of 1.50m. This can come in very useful when adults are bringing toys and furniture in and out, or if they simply want to look inside to see what their children are up to. They’ll also be able to supervise their children through the styrene glazed windows that are included on both levels and on the side. 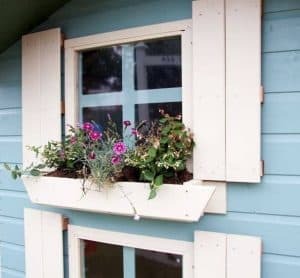 What we liked most about them, aside from how tough and safe they were of course, is that they feature window boxes as standard. That means they can add even more colour to the playhouse if you plant some bright flowers in them. The styrene used on the windows is not only tough and strong, it’s also virtually shatter proof which means you won’t have to worry about you children or grandchildren kicking a ball against them. We always like to see safety made the number one priority on a playhouse, and that’s why we were pleased to see not only that this building complies with strict EN71 toy safety regulations but also that the upper loft area is protected by a safety rail. Young children playing at height of course should always be supervised by an adult, but the rail gives extra reassurance. 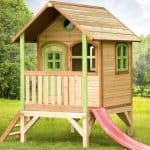 One of the extras available with this playhouse, alongside a range of DIY treatments available in four different shades, is a timber base kit. 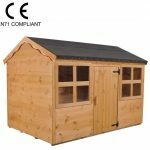 This is ideal for customers who haven’t got a suitably flat base to install the playhouse on, and it also elevates the floor above ground level where moisture content will typically be high. There’s also an option to have the base kit professionally installed and to have the playhouse as a whole professionally installed, although we feel that both of these items can be easily self assembled with an extra pair of hands to help. This is a high quality playhouse, and we were glad to see that despite its size there had been no compromise in its components. The use of a long lasting preservative treatment could have made a big difference to the overall durability, but as it is too much emphasis is placed on the customer carrying out regular treatments. 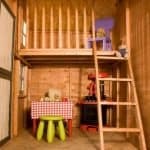 The base area itself is larger than most playhouses we review, and there’s the extra loft level available as well. This can take a little longer to construct than an average playhouse because of its dual level format, but with a friend’s help it can still be completed in around five hours. 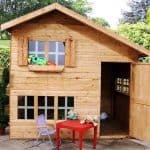 This isn’t one of the cheapest playhouses on the market, but the extra level also gives it extra value. Final Thoughts: There’s only one thing better than a well built and good looking playhouse for children, and that’s a well built, good looking playhouse that has two levels like this one. This will fire the imagination of the little ones in your life, and it also means that it won’t be too cramped even if two or three children are inside at the same time. We were especially glad to see the inclusion of a safety rail, so you won’t have to worry about anything while your children or grandchildren are having fun. The window boxes are another nice addition, and they provide a perfect way to introduce the joys of gardening and nature.